These have high tensile strength and are useful for rockfall protection among other applications. It can be used for stabilizing slopes by pinning them with a combination of mesh and rock or soil anchors, as well as installed as a drape to control erosion. Thus, the frequency and magnitude of events such as rockfall and shallow slumps can be controlled. 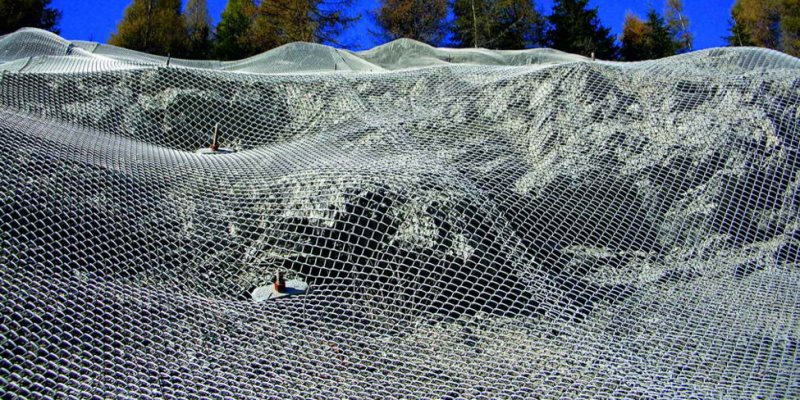 The mesh consists of galvanized high grade corrosion preventing Zinc-Aluminium coating. For installation process, panels are unrolled from top to the bottom in the hazard zones. The different mesh layers are then connected by overlapping and sewing them together with high-tensile sewing rope in the vertical direction. Horizontal connections are made with an original wire strand yielding a seamless connection. Additionally, mesh can be secured by spike plates at anchor positions. Original slope geometry is maintained. Aesthetically more acceptable than other conventional measures.